What would you do if you woke up in someone else’s body, with no memory of how you got there or who you where? It’s happened to Mercy before, but that doesn’t make it any easier to adjust to taking over someone else’s life. When she wakes up on a bus in the body of Carmen, a shy girl who loves to sing, she has no idea what’s going on. She has brief flashes of previous lives, but she doesn’t know who, or even what, she is. She does know that Carmen is shy, and is used to being on the fringes of life, but with her school participating in a vocal concert, and Carmen the lead soloist, Mercy has to learn quickly—and make sure she doesn’t ruin Carmen’s life while she’s at it. She’s staying with the Daley family, whose daughter, Lauren, disappeared two years ago. Lauren’s twin brother, Ryan, is convinced Lauren is still alive, and soon Mercy is, too. But Luc, the mesmerizing man she keeps seeing in her dreams warns her not to interfere. As Mercy helps Ryan search for his sister, she uses a power she doesn’t fully comprehend to learn the truth, and the two grow closer—even as the trail they are following takes an unexpected twist. Mercy must decide between helping Lauren, and helping Carmen. Forced to make an impossible choice, will she learn to use her power before it’s too late? 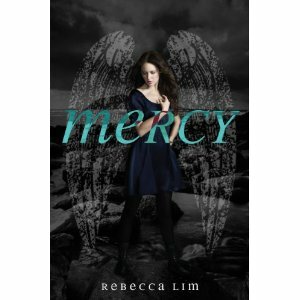 Mercy, by Rebecca Lim, is the first in a series about a fallen angel with amnesia. This books isn’t big on back-story revelations for Mercy, but it is big on mystery and suspense. There are no slow scenes in this book; from the moment Mercy wakes up in Carmen’s body, through her floundering attempts to figure out what’s going on. The author gives us a distinct feeling for Mercy and her confusion, as well as her longing to find out who she is—and to find out just what history she and Luc share.